Vigil hosted at the main fountain at Florida International University between 3:21pm and 3:27pm the times that two Brothers to the Rescue planes were destroyed by air-to-air missiles fired by Cuban MiGs as they flew through international airspace searching for rafters. Family members and friends of Carlos Costa, Pablo Morales, Mario De La Peña and Armando Alejandre Jr. will be in attendance. This event is for FIU students and members of the FIU Community and has been held annually since 1996. February 24, 1996 shoot down was an act of state terrorism that blew two civilian aircraft out of the sky with air to air missiles while in international airspace after regime planned the act months beforehand with its espionage network in the United States. 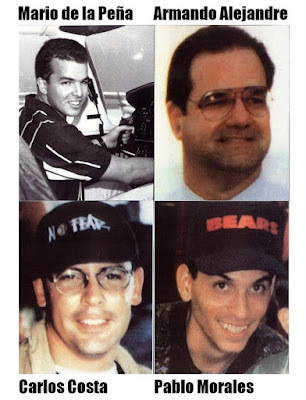 FACT 2: Cuba is responsible for violating the right to life (Article I of the American Declaration of the Rights and Duties of Man) to the detriment of Carlos Costa, Pablo Morales, Mario De La Peña, and Armando Alejandre, who died as a result of the direct actions of its agents on the afternoon of 24 February 1996 while flying through international airspace. FACT 3: Cuba is responsible for violating the right to a fair trial (Article XVIII of the American Declaration of the Rights and Duties of Man) to the detriment of the relatives of Carlos Costa, Pablo Morales, Mario De La Peña, and Armando Alejandre, in that to date the Cuban authorities have not conducted an exhaustive investigation with a view toward prosecuting and punishing the perpetrators and have not indemnified those same relatives for the damage they suffered as a result of those illicit acts. FACT 4: In Alejandre v. Republic of Cuba, 996 F.Supp. 1239 (S.D.Fla. 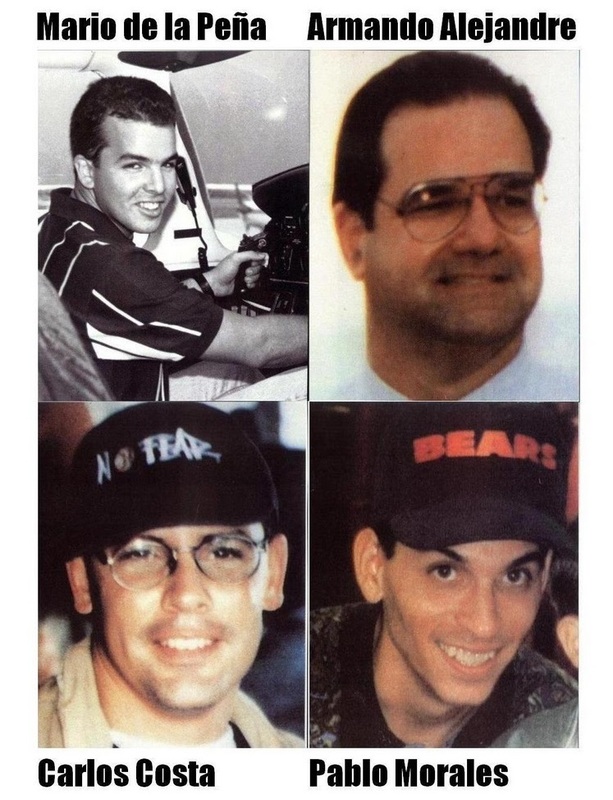 1997), a federal district court awarded the families of three of the four occupants of the “ Brothers to the Rescue” planes shot down by Cuba in 1996 a total of $187.7 million in damages against Cuba. FACT 5: WASP spy network was involved. One of the “illegal officers” (Gerardo Hernandez) was convicted of conspiracy to commit first-degree murder based on his role in the February 24, 1996, shoot-down of two unarmed civilian aircraft in international airspace by Cuban Air Force jet fighters, which resulted in the deaths of four people, three of them U.S. citizens. FACT 6: Brothers to the Rescue had spotted and saved thousands of rafters in the Florida Straits and was engaged in such a mission on that day. The one plane that skirted the boundary briefly was the only one to return. The other two were shotdown miles away from Cuba’s boundary having never entered or touched it on that day and the planes had been in contact with the Cuban tower throughout the flight. FACT 7: On July 26, 1996 the United Nations Security Council: "Noting that the unlawful downing of two civil aircraft on 24 February by the Cuban Air Force violated the principle that States must refrain from using weapons against airborne civil aircraft, the Security Council this afternoon condemned such use as being incompatible with the rules of customary international law "
FACT 8: Ana Belen Montes, the US intelligence community's top analyst on Cuban affairs had throughout a sixteen-year career at the Defense Intelligence Agency sent the Cuba intelligence service sensitive and secret information and helped to shape US opinion on Cuba. Investigation against her was triggered by her odd behavior before and after the Brothers to the Rescue shoot down. On September 21 2001 Ana Belen Montes was arrested and subsequently charged with Conspiracy to Commit Espionage for the government of Cuba. Montes eventually pleaded guilty to spying, and in October, 2002, she was sentenced to a 25-year prison term followed by 5 years of probation. FACT 9: On December 27, 2010 and again in a January 19, 2011 clarification the defense of Cuban spy-master Gerardo Hernandez acknowledged that "there was overwhelming evidence that the 1996 shoot-down of two Brothers to the Rescue planes occurred in international airspace, not Cuban territory." FACT 10: On December 17, 2014 President Barack Obama commuted Gerardo Hernandez’s two life sentences and returned him along with two other spies jailed for crimes in the United States to Cuba where they were received with a hero’s welcome in what is an immense propaganda victory for the Castro regime. The Free Cuba Foundation is an action oriented youth movement committed to defending human rights, support the Cuban internal democratic opposition, and advocate for the principles of Gandhian non-violence.